We have earned a reputation of dignified manufacturer and exporter of excellent quality Close Up Toothpaste. Offered toothpaste gently cleans whitens Red gel with fluoride protects teeth against cavities. The toothpaste offered by us aids in the prevention of dental decay great toothpaste seems to be keeping my teeth white. Co-created with cosmetic dentists, Closeup Diamond Attraction is a revolutionary toothpaste that makes use of patented blue light technology which works instantly to make teeth whiter, and over time it continues to work to give you a whiter, brighter and more radiant smile. -. Through continuous use, you will achieve progressive whitening action. See the instant whitening power of White Now, in Ice Cool Mint flavour. 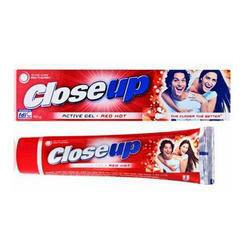 Owing to our in-depth industry experience and precise knowledge of this domain, we are trading an outstanding assortment of Close-Up Toothpaste. -. This unique dual-coloured toothpaste gives dual sensations: a warming gel to help fight germs that cause bad breath; a cooling gel to give you an intense cooling that lasts. Feel the the unbelievably long-lasting chill & warmth of Fire-Freeze. Now make heads turn every time you walk into a room with your dazzling white smile. 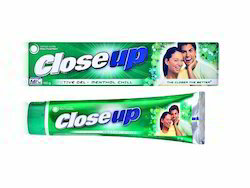 For the first time a revolutionary new Closeup range, co-created with cosmetic dentists - our most advanced innovation yet. Flavour Base: As per customer requirement. Power Input (Watt): As per customer requirement. Up to 12 hours lasting fresh breath to stay closer for longer. Diamond Attraction - Power White Now make heads turn every time you walk into a room with your dazzling white smile.